Myanmar has to be one of my favourite destinations in Asia. There are amazing things to see in Myanmar. It is also one of the more controversial destinations to visit. Below, I discuss whether you should have a Myanmar holiday at all and all the practical information about this country including visas, how to get around, what to pack, etc. 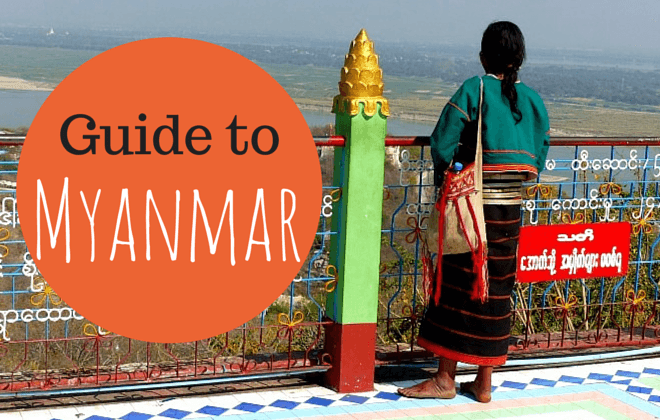 You can also read my guides to Mandalay, Bagan and Yangon as part of this Myanmar travel blog. Should you go to Myanmar? Beyond the questions about whether you would enjoy Myanmar, what there is to do, how much it costs etc, is the question about whether it is responsible to travel to Myanmar or if you are hurting this country’s people. In very simple terms, Myanmar was ruled for years by a repressive military dictatorship. Free speech and political opposition was suppressed. There was ethnic civil war. Economic sanctions were put in place and the country’s pro-democracy leaders asked for an international travel boycott. Many people headed their advice (myself included) and the number of tourists that visited Myanmar were low. The political direction of Myanmar has improved. In 2010, elections were held and a civilian president is now in power. Sanctions have been lifted. Calls for tourists to avoid visiting have quietened. However, the elections were far from fair and violence between different ethic groups still continues. Whether to visit or not is a personal choice. If you do decide to go, travelling responsibly is recommended. Your holiday in Myanmar should involve as much local travel as possible to try and avoid putting money into the Government’s hands. Stay at local guesthouses, eat at local restaurants and shop at local markets. It is an amazing country and the upside of all of this is the lack of tourists. Even though people talk as thought Myanmar is full of tourists now that was not my reality at all. At most tourist attractions, I saw other foreign tourists, but I spent most days without seeing barely any just by walking around the cities and towns that I visited. 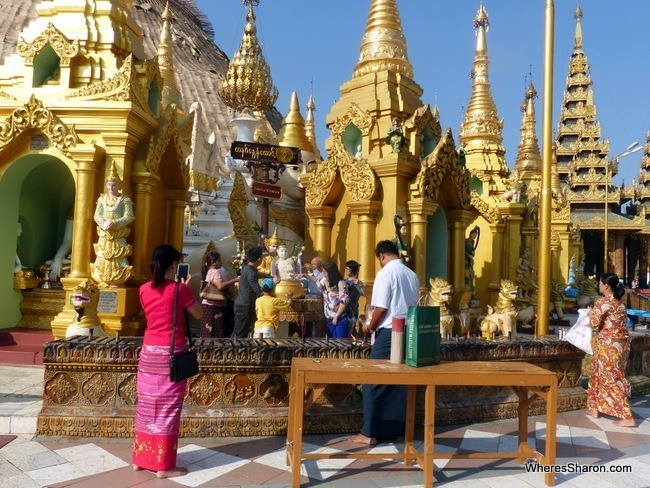 I only saw two other foreigners in the couple of hours that I spent at Shwedagon Pagoda. I did see bus loads at the more tourist focused destinations in Mandalay though, but it was hardly overrun. I flew into Mandalay from Bangkok. I caught the free Air Asia shuttle into town and checked into the M3 Hotel (you can see the latest prices for this hotel here). 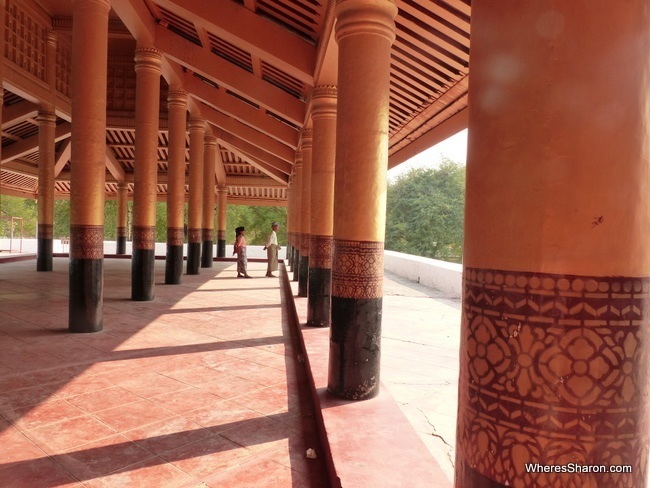 I then explored Mandalay Palace and Mandalay Hill. I took a boat to Mingun and explored this area. 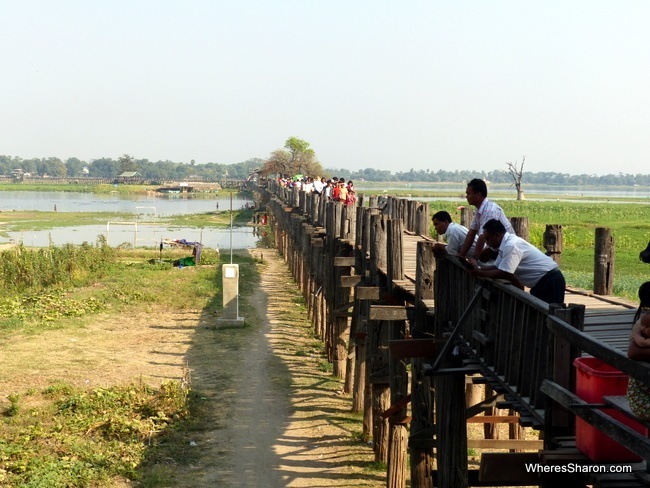 On my return to Mandalay, I hired a taxi to take me to Sagaing Hill, Inwa and U-Bein bridge. 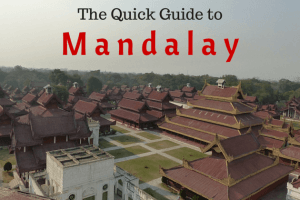 Read more about Mandalay in my guide. I was up early and flew to Bagan. I was in Bagan before 8am and headed straight to Ananda Pahto. I then walked around Old Bagan and some of the surrounds before having a late lunch at Be Kind To Animals The Moon. I then headed back to the airport and did some work while waiting for my early evening flight to Yangon. 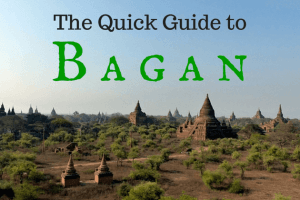 Read my guide to Bagan here. 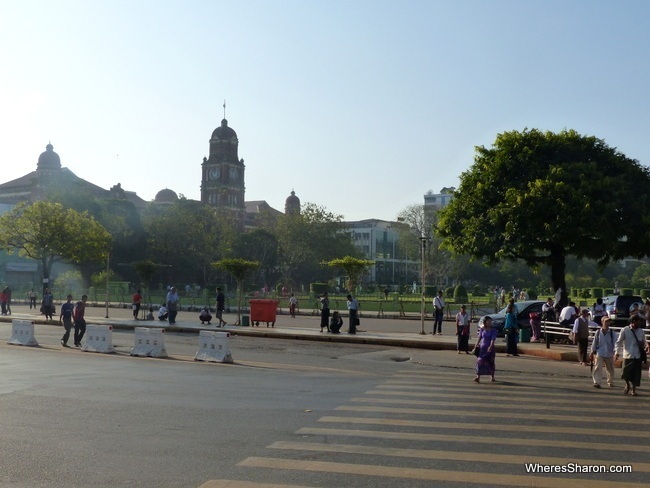 In Yangon, I caught a taxi to my hotel (more details here) and went for a walk to get a feel for Yangon. It was well and truly dark at this point but the streets were alive and I felt perfectly safe. I had dinner at a street stall. I was up early to explore Yangon in the nice, cool air. I started with a walking tour that was in Lonely Planet and took me around some temples and colonial architecture in Yangon. It was still early so I caught a taxi to Shwedagon Pagoda. I spent a couple of hours here before having lunch and taking a break from sightseeing. I then visited the Bogyoke Aung San Market and walked around some more before an early dinner. 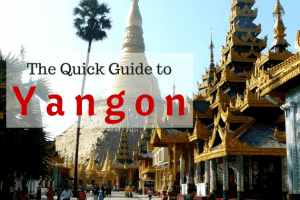 Read the full guide to Yangon here. I headed back early to the airport ready to return to my family in Malaysia. I decided not to travel to Myanmar with kids primarily because of the ground transportation. Every option seemed long and arduous and just not something worth trying with a 2 and a 4 year old. Flying around would have been ok, but too expensive for four of us. I feel like this was a good decision. With older kids that are happy to deal with long travel days, then I am sure it would be fine. My other concern was the tourist attractions in Myanmar. There are kid friendly attractions, but the fact is that basically everything I did in Mandalay would not have been suitable for young kids. I am not sure it would have been worth all the effort to get there, just to play in a playground and go to the zoo. 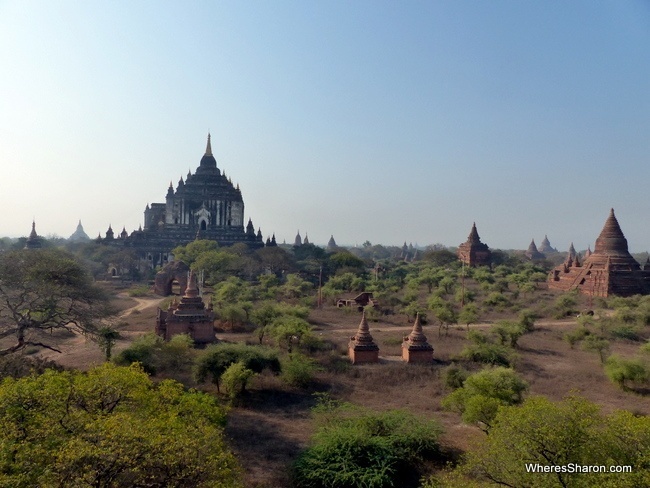 I would have hated to go and miss out on what I saw as Myanmar’s top attractions. Yangon is different and I think we would have lots of fun there. The locals are very welcoming of children, and I do not think you would have any problems visiting Myanmar with kids – as long as you have the money to fly or kids who can deal with long journeys. If you are nervous about the idea of exploring Myanmar by yourself or wish to make everything super easy, then tailor made travel in Myanmar is a great option. Shanti Travel are experts at organising trips perfect for individuals or your family with many local experts and a local travel agency based in Yangon. They have unique itineraries which can be customised to your needs as well as 24/7 assistance. More information in their travel blog here. I can only talk about hot season as that is what it was when I was there. I worried beforehand as I have been to Thailand and Cambodia in hot season before and did not enjoy it very much. I did not find it bad in Myanmar. It was a dry heat so I found it much more pleasant than Malaysia and it only bothered me in the middle of the day if I stood in direct sunlight. In the morning and evening, the weather was cooler than I am used to. Going to Myanmar is going to include a flight to a neighbouring country and then flying on. I flew Air Asia between Myanmar and Bangkok and Kuala Lumpur. It was cheap and easy. My 2.5 hour flight from Yangon to Kuala Lumpur was only US$50! Check the latest visa restrictions before you book your flight. Just after booking my flights, they started issuing visas on arrival at Yangon airport. This was very annoying since I had booked to fly into Mandalay (but would have done it differently otherwise). It is now fine at both airports, but these things can change. Just about all foreigners need a visa. This process is much more straightforward now that you can apply for an eVisa – check out full information here. There are many ATMS sprinkled around the places I visited. Be warned that many do not work. I walked around for hours the one morning I wanted to use one as they kept being out of service. There is a 5,000 kyat fee on all withdrawals (about US$5). I recommend bringing US dollars to avoid these fees and hassles. They are easy to change. The higher the dollar value on the bill, the better exchange rate you will get. I read a lot of blogs before my visit saying that you need notes in pristine condition, but this isn’t true anymore. I was able to change folded notes, but I would ensure they are all relatively good. 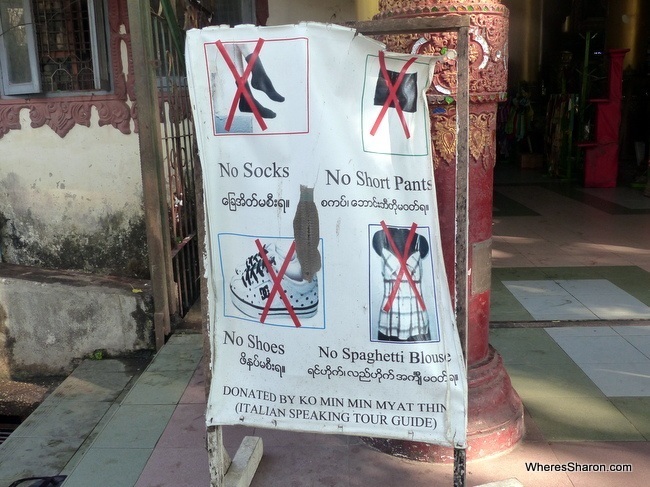 I found three variations in Myanmar – British, Europe and Australia style! Be prepared. There were two different styles in each of my hotel rooms. Getting around Myanmar can be hard work. There are boats, buses and trains that will get you to most parts of this country. Journey times can be long, uncomfortable and things go wrong. This article about train travel in Myanmar ensured I never took one! Locals told me to keep away from the trains as well. I was on such a tight timeframe that flying was the best option. On some routes it is actually quite affordable and not much different to the more comfortable land options. I flew Air Bagan from Mandalay to Bagan. I actually booked the ticket with Golden Myanmar online, but this flight was cancelled and I was automatically transferred to an Air Bagan flight at the same time. It was only a 30 minute flight, but it was great. It seemed like a new plane. It was mostly empty and they have me coke and lollies. I was happy! 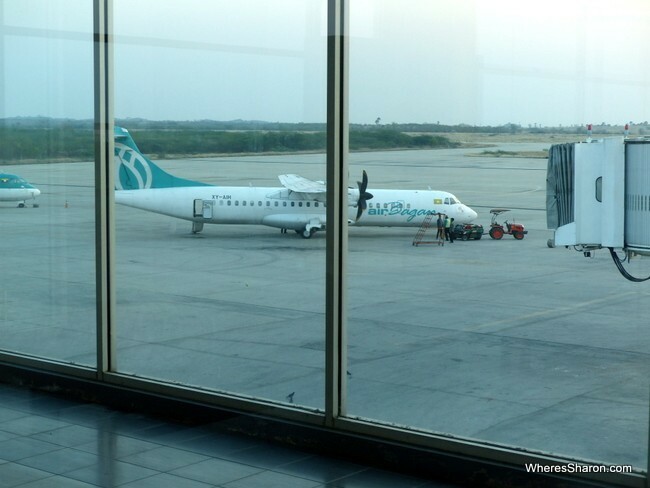 I flew Air KBZ from Bagan to Yangon which I also booked online. This flight was also very smooth and easy. I received a small meal and a snack and the flight took about 1.25 hours. It is very unusual to see anyone in short shorts/dresses/skirts or singlet tops even foreigners. People (both locals and foreigners) wore clothes that kept shoulders and knees covered. These areas are required to be covered at temples. This includes men as well. If your shorts come to your knees (but don’t cover them), you will need a sorong or the local longyi to wear at these times. I recommend taking 3/4 length pants such as this or the good old fisherman pants. I also recommend taking everything you need with you into the country. I did not see much variety in goods and although things like toiletries are everywhere, they are not necessarily what you will find at home. Definitely take your own sunscreen. I absolutely loved Myanmar. It was like stepping back in time to how I imagine SE Asia used to be. I hate clichés like that but I don’t know how else to describe it. To use another cliché, it is somewhere you should definitely visit now – don’t wait! I am sure things will change quickly as more people visit. For me, it was a perfect level of tourism at the moment. Enough tourists that enough people spoke some English and there were enough signs that getting around and dealing with the practicalities of travelling in a country were easy, but there are not so many tourists that I couldn’t escape them or that the people have started overly trying to take advantage of tourists and their money like in a lot of other SE Asian countries. The people are friendly and welcoming. Many are trying to learn English and ask to practise with you. Initially, I thought maybe they were trying to rip me off in some way, but that is just not the case in Myanmar. It is also very interesting and there are plenty of places to visit in Myanmar. I would have also liked to go to Inle Lake and the coast. However, I did have a fabulous introduction with visiting Yangon, Mandalay and Bagan. My best things to do in Myanmar all centre around these places. All of them are quite different with quite different Myanmar tourist attractions. 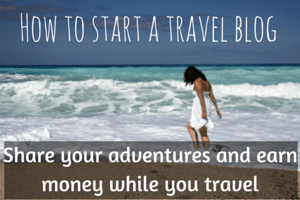 I recommend them all when you plan your own Myanmar holiday – which I hope you are doing! It’s an amazing place – Go now!